Coupons have been around since time immemorial. Merchants have used physical coupons in all possible ways to get customers to the store, shop in quantity, drive impulse purchases, etc. Then what has changed? How does the e-commerce and coupons dynamic play up? E-Commerce has changed the way people shop; it has increased both customer convenience and competition. You no longer need coupons to get customers to your brick-and-motor store or have them delivered in mail. But coupons are still relevant; they might have a new avatar but the philosophy still holds true because of which they are currently adopted by nearly the entirety of the E-Commerce World. The most popular ones are embedded right into the pages of the -commerce site which makes it convenient for both visibility and usability of the buyer. Needless to say, Coupons are highly relished by buyers and have been multiplying purchases by a great fold. They help in acquiring new customers, in getting your inactive customers active and getting your regular customers to buy more. Coupons also help in augmenting customer satisfaction and drive recurring purchases while increasing customer loyalty (which in turns can get more customers through word-of-mouth referrals/recommendations). 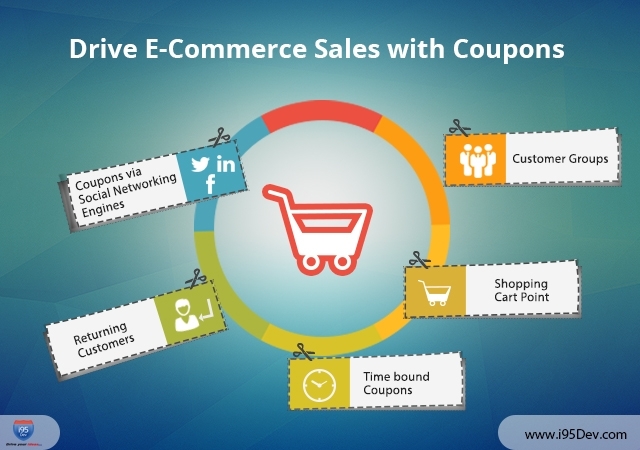 Coupon is like a candy with a toy – it not only drive sales but also ensures customers makes happy purchases. What are a few most yielding E-Commerce Coupon plans & Delivery mechanisms? Customer Groups: Design Coupons particularly for use by specific customer groups on your site and have them emailed or messaged on Mobile phones. Create coupons with unique codes for better analytics and ROI measurement. Shopping Cart Point: Once customers fill their wishlists or are adding products to their cart, award them with a flash Coupon slashing away the price of one of the products in their wishlist or shopping cart or for a product which they have purchased in past. You can also club products (based on wish list, purchase history or cross-sell products) and offer them combo offers for increasing the order size. Time bound Coupons: Leverage your home page banner to display coupons valid only for a specific period for use by all customers, registered or otherwise. These time bound offers create a sense of urgency and are very effective during festive/holiday/important events seasons. Returning Customers: A returning customer often purchase as high as 33% more than a new customer. Reward your returning customers with special coupons thanking them for their loyalty to keep them coming back for more. You can also encourage them to forward those coupons to friends and family not only making them feel empowered but also driving sales through referrals. Coupons via Social Networking Engines: Facebook and Twitter are most effective delivery channels for your coupons. These platforms can be leveraged to the maximum to drive both sales and traffic to your business. Track and analyze how effective all coupons have been based on goals (drive traffic, increase sales, increase order size, etc.) you started with. You can further drill down these reports to understand which coupons were effective on which channel. This will help you understand what works for your customer base and what channels to use the next time you want to do a similar campaign. But don’t give up on strategies which did not work, tweak them a little and use them again to see if they work.